While updating the student pathfinders for natural disasters I came across some interesting media and resources that may be useful in your classroom. 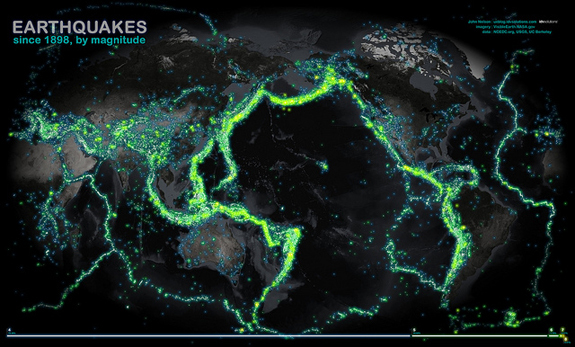 This summer the Smithsonian blog published a beautiful image (right) showing the location of earthquakes over the last 100 years. Visit the original post to read the story behind the image, see a drawing of tectonic plate locations, as well as a 40 year seismograph image. Of course, GTSD access to subscription resources such as EBSCO, Discovery Education and BrainPop offer great information, media, games, lesson plans and quizzes related to earthquakes. Login and password are required for these resources, easy access to EBSCO and BrainPop are available through the wikis (faculty, GS, and SM).